This is going to be a long one, so make yourself comfortable. To reveal something about the kinds of dance happening in Baltimore, three separate sections of the BRDS included lists of Dance Forms. Vocabulary for these sections was derived from descriptions on websites of performers and studios in the region and combined into a set of 19 similar “forms” to keep the survey tolerable. Dance forms that had specific functional requirements were separated where practical (e.g., Aerialists need rigging, Acro needs padded surfaces, Flamenco needs hard floors). Even so, these were tough questions to address. Dance forms were presented in descending order of popularity by available classes, and a final “Other” option allowed respondents to include forms they felt were unrecognized in the available descriptions. Having said all that, dance is a fluid discipline, and the boundaries between dance forms are often not well-defined (an exception, of course, is a rigorous ballet syllabus…). The two-letter abbreviations were not included in the survey instrument, but will be used to make graphics readable in analysis. This list was presented to each respondent up to three different times – Respondents were asked how many years of experience they had learning, teaching, and performing in each of the described forms. 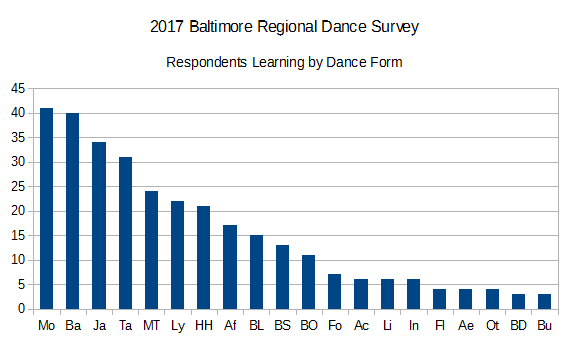 The resulting set of three matrices includes 4800 data points (80 valid respondents, 20 dance forms, 3 dimensions) on the kinds of dance active in Baltimore. Let’s start with the “Other” dance form. I completely failed on Creative Movement – I was definitely aware of it, but flaked on its inclusion probably because I built the first list from performer descriptions, and there aren’t a lot of creative movement shows. That doesn’t mean there aren’t a lot of teachers and students out there (although many of the students won’t be filling out online surveys…). Performers indicated that the BRDS missed “Hawaiian,” “Creative Movement/Dance Integration/STEAM,” “Caribbean,” “Performance Theater,” and “Experimental.” Instructors indicated that the BRDS missed “Creative Movement,” “Caribbean,” “Line dance,” “Wheelchair bound ballroom dance movement,” “Somatic Classes,” “Dance History,” and “Composition/Improvisation.” And students suggested “Creative Movement,” “Caribbean,” “Somatic Classes,” “Functional Awareness,” and “Flash Mob” classes were missing. Some of these can be integrated into the existing Forms list (e.g., I think Hawaiian is a candidate for inclusion in Folkloric and Experimental may be some variation/extension of post-modern/contemporary). Some of these will remain a challenge. I’m not entirely clear on “Dance History” – that could be teaching historic dances, or… teaching a history of dance. If it’s the latter, we’ll find that in a different part of the survey. I welcome your thoughts on improving these categories. 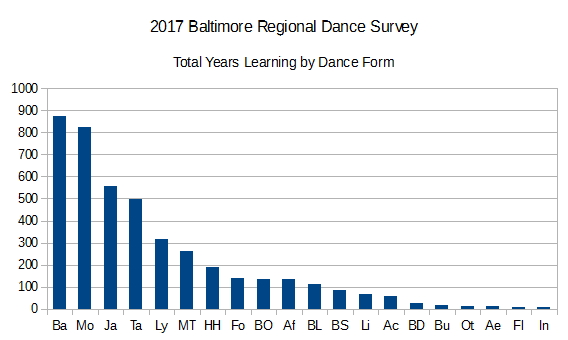 Based on those responses, this dataset represents at least, 4125 FORM-YEARS of performance experience (the most popular performance dance forms representing 848 years of Modern/Contemporary, 713 years of Ballet, 522 years of Jazz, 317 years of Lyrical, and 287 years of Tap), at least 2827 FORM-YEARS of dance teaching experience (the most popular teaching dance forms representing 551 years of Modern/Contemporary, 447 years of Ballet, 317 years of Jazz, 309 years of Tap, and 234 years of Lyrical), and 4331 FORM-YEARS of dance class experience (the most popular dance forms represent 872 years of Ballet, 822 years of Modern/Contemporary, 555 years of Jazz, 499 years of Tap, and 317 years of Lyrical). Today, I’ll dive a bit further into the detail, starting with the students of dance in the Baltimore region. In this analysis, Modern takes a slight lead (41 respondents) over Ballet (40), but the traditional studio dances (Modern, Ballet, Jazz, Tap) hold all the top slots. African (17) beat out all of the Ballroom forms (Latin/15, Standard/13, Other/11), but that might have something to do with the partnering nature of Ballroom. Five forms (Flamenco, Aerial, Other, Belly Dance, and Burlesque) were represented by 5 or fewer respondents, so it’s easy to conclude that these were largely missed in the sample. 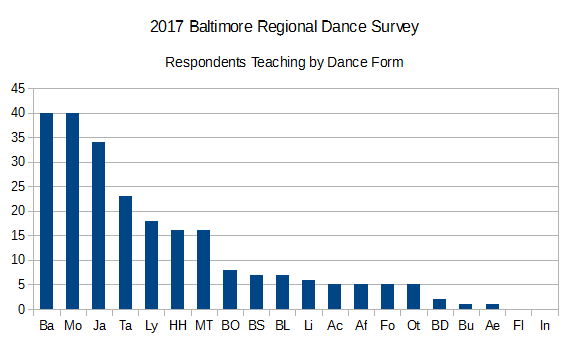 Many others are as well – only 6 respondents claimed any study in liturgical dancing, but I know there’s a large number of church-based dance groups in Baltimore. No surprise that ballet, takes the top position in this chart with 872 total years, since ballerinas often start very young. Again, the traditional studio dances (this time in Ballet, Modern, Jazz, Tap order) hold all the top slots. Most of the others are probably under-represented within the small sample size. Hip Hop only clocked in at 187 form-years. The various Ballroom forms (BO, BL, BS) account for a combined 333 form-years. Flamenco only managed 9 form-years, 5 of which were from one respondent, so the survey almost completely missed at the low-end of the chart. There is an interesting feature in this chart – Ballet and Modern (about 850 form-years each) demonstrate a large gap over Jazz and Tap (525 form-years each). Ballet is probably explained by the well-developed and decade-long training path, but Modern is much less structured (I think?) and learning modern probably starts much later in life than Ballet. The near-parity of Modern and Ballet both in respondents (41 vs. 40) and respondent-years (822 vs. 872) probably says something about the choices dancers in this region make after they’ve endured obligatory years of Ballet. Is this a first clue that Baltimore is a Modern Dance Town? The low end of the chart again reveals limitations of the sample size. At the upper-end, the Big Four studio dance forms take all the slots, but this time there’s a meaningful gap between Ballet and Modern (40 instructors each) and Jazz (34), and another meaningful gap between Jazz (34) and Tap (23). Given the small sample size (and partnering requirement), I’m a bit surprised that the Ballroom forms managed such high representation (7 or 8 instructors in each). This might say something about the economics of a dance instruction career. 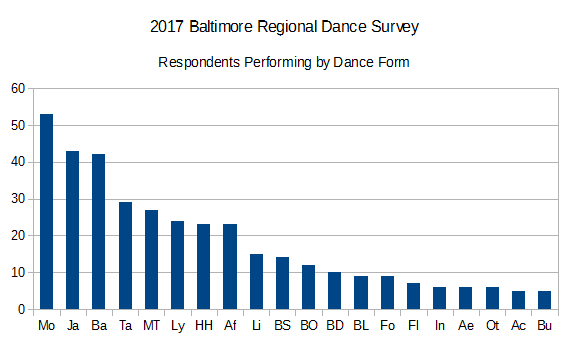 Aerial is the lowest non-zero form in this chart, which means the survey definitely missed aerialist legacies in Baltimore – more evidence of small sample size. Here, Jazz and Tap (317 and 309 form-years respectively) are close to parity, so that may suggest that the tap instructors are generally more experienced in Baltimore. Finally, we get to the performers. In this dimension, Jazz takes a surprising leap over Ballet (obviously, the survey didn’t reach the large Ballet companies), but Modern has a clear and distinct lead on all other forms, with 53 respondents engaged in Modern performance at some point in their lifetime. This may be a second hint that Baltimore is a place for Modern Dance. There are two gaps in the upper end of the chart – between Modern and Jazz+Ballet, and another between Jazz+Ballet and Tap. For performances, Musical Theater, Lyrical, Hip Hop, and African are very well represented. In the performance dimension, as with Teaching, we once again have the Modern cluster coming in a bit higher than Ballet. Gap down to Jazz, and then gap down to Lyrical, which comes in a bit higher than Tap. It seems that Tap is highly cyclical, and it’s been a while since a tap sensation stirred broad new interest in the form. 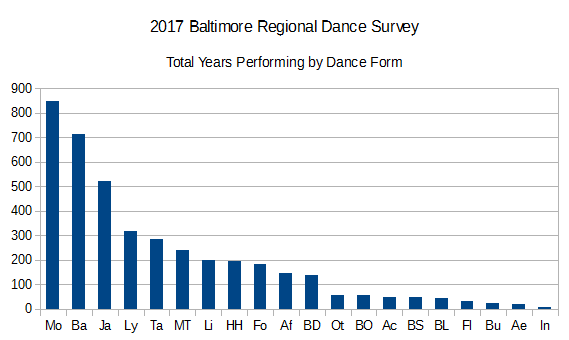 So that’s a very high-level presentation of dance represented in the 2017 Baltimore Regional Dance Survey. Later, I’ll come at this same data from a different angle.